Two weeks ago I acquired a 3D printer; specifically the Printrbot Simple Metal Kit and, after some warranty help, it’s printing well. The first thing I printed was the fan shroud for the 3D printer itself, as recommended by Printrbot, but the next things were for my own design. I printed a set of three sieves, to fulfill my long-time dream of quantifying the performance of coffee mills. For those of you who read my coffee blog posts years ago, I was frustrated because nobody quantifies the grind performance. Vendors and coffee pundits are happy to talk about the merits of a conical burr grinder or fret about the cheap blade grinder you got from your lost year with Gevalia. Quantifying grinder performance should be pretty straightforward. Take a set of sieves and sort the grinds by size, the more consistent grinders will produce more grounds in a narrow range of sizes. Spoiler: I have only measured my whirling blade grinder so far, not my Capresso burr grinder or any of the commercial grinders. The printed sieves are just cylinders with a printed mesh bottom. They don’t stack well, since I used too little taper. My finest one had holes so small that it plugged with the finest coffee dust, so there is more to do in the sieve design. Nevertheless, I started with the mesh from Thingiverse, and added 15 mm of wall height. When I get a version of these that stacks I’ll post the design to the Thingiverse too. I arranged the sieves in a stack and shook. The sieves clogged almost immediately, so I took a small brush and worked the from the top layer down until I had good separation. The results, in the following picture, show that almost no particles were larger than my largest mesh, less than half were larger than my medium mesh, and the rest were larger than my fine mesh. So what are the mesh sizes? I took macro photos of the meshes and then measured them optically—you know, counted pixels. The composite photo below shows the basic idea, and below that is a zoomed-in version of the medium sieve. The medium sieve is made from “threads”, where each “thread” is two passes with the extruder head. It should be possible to do a single extruder path, but I have not yet tuned the OpenSCAD file to get a consistent result. Whether grind consistency can actually be identified by a taster in a blind test is an open, and wonderful, question. Happy brewing! A friend of mine (thanks Marc!) forwarded the linked article to me last week. While it is more of a coffee tease sort of thing than anything else, it just so happens that the article discusses the coffee/water ratio used by some of these gluttons. You’ll be surprised how modest my recipe looks. New York is Finally Taking Its Coffee Seriously, NY Times, March 9, 2010. 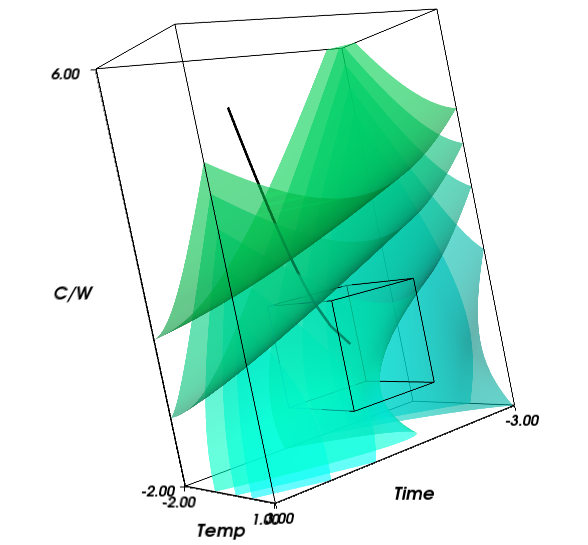 The results of my 4-trial fractional factorial experiment (main effects) showed that extraction time is the most important variable, and that temperature and C/W ratio are less important. In the interest of completeness this experiment will not simply vary extraction time, but rather seek to efficiently find the maximum. I am accustomed to making my coffee with about 22 fluid ounces of water, which makes two nice cups for my morning. During the screening I used 22 fl oz as a baseline, and increased or decreased the amount of coffee accordingly. The result was that some experiments required 48.8 g of coffee. You can’t possibly imagine how much coffee that is. It almost completely fills a coffee cup with just the beans! In subsequent experiments I will limit the amount of coffee beans to something more modest, perhaps about 20 g, and vary the amount of water. With this more cautious approach I may live to see the final results. 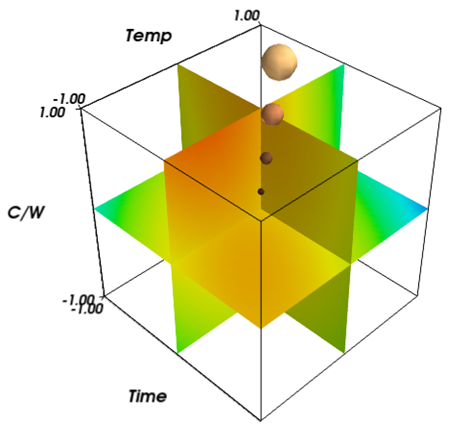 NIST offered three designs for response surface objective (RSO) experiments. Specifically there are two interpretations of the Box-Wilson central composite design, each of which requires 20 total runs. An alternative design reduces the number of experiments to 15, which is the reason I chose it. This set will take me about three weeks. With luck by the time you read this I will have trickled out previous articles, and you will have results in two weeks or less. Sorry for the suspense. Oh yes, I’m interested in other people’s Q functions too, so if you want to run my exact experiments, please post your data and I will post your results. Public or anonymous, at your discretion. Please, when you are shopping for a grinder, don’t believe anything you hear (except what I tell you…). A blade grinder is probably as good a grinder as you want to afford. Don’t presume that a burr grinder will automatically produce a more consistent grind. Take, for example, my manual burr machine. Compare the grind consistencies from my cheapo blade grinder with my burr grinder in the following picture. Neither is “consistent”, and the variation from the burr grinder goes from about 4 mm to dust. The blade grinder produces 1 mm to dust. Neither appears to produce a dominant particle. You may want to cover your children’s eyes; even a brief look at this grinder could give them nightmares. 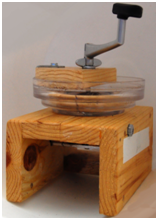 Detestitron is a heavily modified portable burr grinder. It was about $20, but it uses conical ceramic burrs and is quite ingeniously designed. 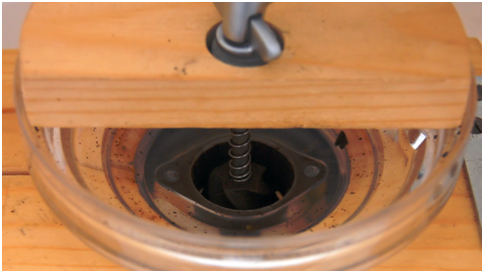 The modifications I made to the original grinder maintain concentricity between the inner and outer cones, and facilitate holding the cursed thing to the table while turning the crank. The grind consistency, for all that, did not actually improve noticeably. The Detestitron’s grind axle is centered in ball bearings. The original shaft was extended with a small brass rod, brazed on. The bottom bearing is fixed in an aluminum bar, which is in turn screwed to the chassis. Note that the center cone is not perfectly round, and so this keeps the grinder very stable—but it is not really centered. The burrs are basically the same as you would see on a pepper mill, but much larger. 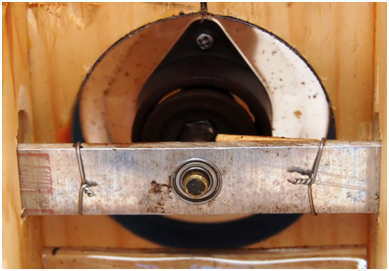 There is a screw-like mechanism to force the beans into the narrow grinding slot. Detestitron’s fundamental problem is that the length of the surfaces over which there is a consistent separation is very short—the coarser the grind, the shorter the overlapping length. I believe that any grinder with similar burrs would produce similar results. There are other designs, but they seem to start at about $200. Did I mention donations are welcome? I have conducted the trials in the following table. This study is a 2-factor partial factorial design, indicated as 23-1. The good people who write for Wikipedia tell me that this experiment design gives “main effects” but those may be confounded with two-factor interactions. Indeed, there is some reason to be concerned for the simple quality function evaluation in this situation—for example, I worry that row 1 and row 2 could easily produce similar effects. 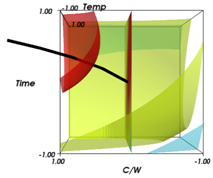 C/W is lower in 1, but the temperature is higher, so extraction should be similar to a higher ratio with lower temperature. In any case, if the result is not revealing, the experiment may be augmented with the remaining 4 cases in the factorial design. 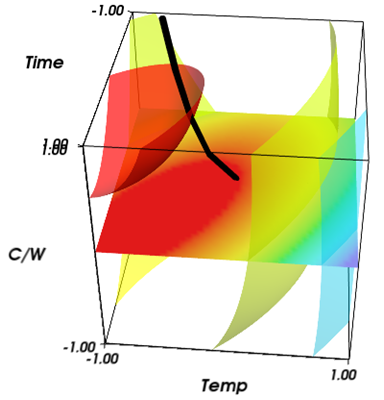 The main effects plot shows how each parameter influences the result, though recognize that interactions may be masking main effects. 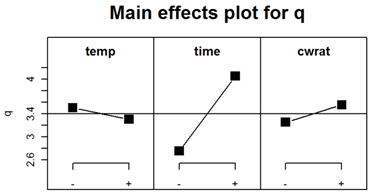 The main effects plot for this experiment is shown below. 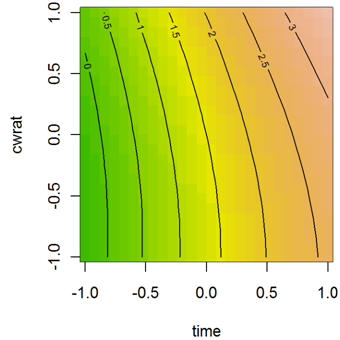 From this it would appear that extraction time is the most sensitive parameter—to me a surprising observation. I had certainly expected the coffee/water ratio (cwrat) to be the dominant variable, but here it does not appear to be so. 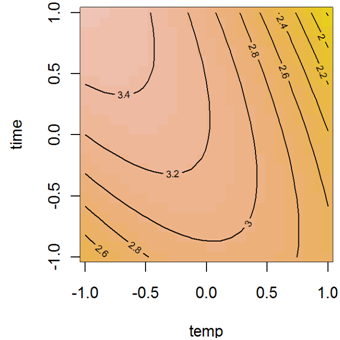 The negative correlation with temperature is very surprising, and indeed I am skeptical. 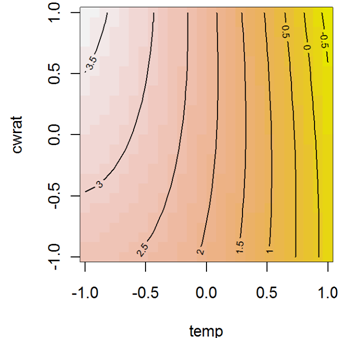 Still, the variation appears to be quite small, and is likely due to two-factor interactions. 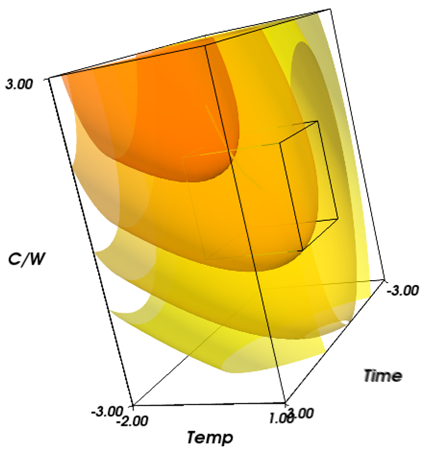 I would be inclined to fix the temperature and the C/W ratio at their midpoints, and vary the time alone; however, I believe the response hypersurface is more complex. I shall press forward with the response surface methodology on all three variables. In case you want to see my data. 1 2.5 2/16/09 Dishwatery taste and aroma. Very simple palate with almost no mouth feel. Equivalent to mediocre drip. 2 3 2/17/09 Not very aromatic and too simple. Has nice bitterness and some acidity but not well balanced between them. 3 4 2/18/09 Mildly aromatic. Good mouth feel with acid/bitter well balanced. Slight char flavor. 4 4.1 2/19/09 Too bitter. The aroma is marvelous being very rich and tantalizing. Mouth feel is creamy. If bitterness where attenuated this would be sublime. I wasn’t going to use fractions, but I decided I needed them. Note that trial 4 was assigned a quality of 4.1, which is really a note saying that this was a little bit better than trial 3, but not much. I will invoke a variety of principals from experiment design methods. The truth is, though, that I’m self-taught in experiment design. It is altogether probable that there are better ways of conducting this experiment which my ignorance has hidden from me. I’m open to suggestions! 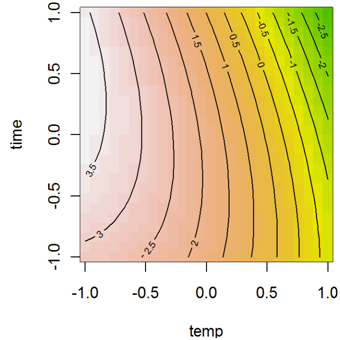 The variables in control are temperature t, extraction time T, and coffee-to-water ratio (by weight) r. Each of these will be considered over a domain of 5 values. 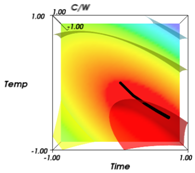 Temperature and coffee-to-water ratio are linearly divided into 5 steps between their minimum and maximum values, which I selected based on published coffee brewing advice. Extraction time is divided logarithmically over its domain, since my intuition is that extraction is an approximately logarithmic process in time. 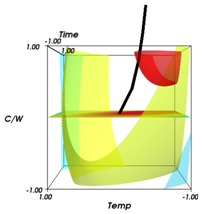 In English, first find the best point by finding the optimum coffee-to-water ratio for a fixed extraction period and temperature. My experience suggests that the ratio is likely to be one of the more sensitive parameters, so sweeping this first should provide good insight. Then, using that optimum C/W ratio, sweep the extraction time to find the best duration. Finally, sweep the temperature. Really, this is a sort of bastardized gradient search. It doesn’t account for correlation among parameters. For example, you might imagine that a very high C/W ratio combined with a short extraction time would produce a very different flavor than the same high C/W ratio and a long extraction time. In fact, one might be delicious and the other dreadful. The proposed methodology, however, would not reveal that condition. Another problem is that it really isn’t safe to assume only 15 trials would be required. The quality function (my enjoyment) is likely to be quite subjective and quite variable—I’ll assume for argument that it is also Gaussian. 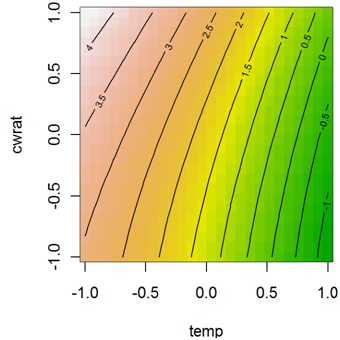 Q can take integer values from 1 to 5, and it is quite reasonable to assume that my variability has a standard deviation is 1.5 or so. To know the actual quality accurate to a single value of Q with 95% certainty requires the standard deviation to be about 0.25. 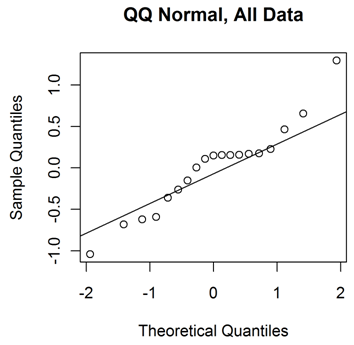 We can reduce the standard deviation of the estimated Q by averaging multiple experiments. How many? (1.5/0.25)2 = 25. Now the original 15 trials have turned into 15×25 = 375, and at 1 experiment per day pushed the answer a year into the future. A savvy person might ask if there is a way to find an equally good answer with fewer experiments or if there is a better way to arrange those 375 experiments to get more broadly useful answers. 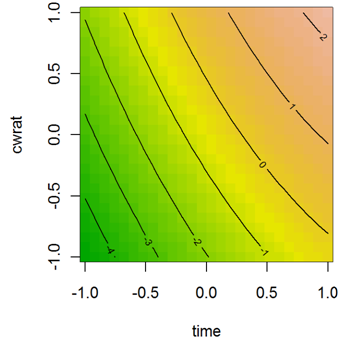 NIST provides a sublime search tree for selecting an experiment design, and it is clear that what I’ve outlined is best served by a response surface objective (RSO) on 3 factors, or possibly a main effects design first, followed by a response surface objective on 2 or 3 factors, or even a simple 1-factor search. While I expect to consider the RSO approach in terms of number of experiments, and then examine a screen+RSO approach to see if there is a design which offers possibly reduced number of experiments. The Box-Behnken design for RSO in 3-factors requires a paltry 15 experiments. Still, that is three weeks away, and I would prefer to have some data to work with sooner. The screening test is much smaller, and perhaps worthwhile in that the data can be included in the RSO experiment, even though not strictly required. For my 3-factor system the Level III screening design requires a modest 4 runs. This would be small enough that I could even do two trials of each, which would be of great help in reducing my variability. The experiments are listed in the following table. The other major effect that I would like to measure is grind size, predicated on substantially uniform product. My grinder doesn’t do it. Consider, though, the 4-factor version of this same exercise. The four-factor RSO requires 33, 46, or 52 experiments, depending on the method. The four-factor screen requires 8 experiments. Even if the screening doesn’t reduce the number of factors substantially, the experiment is tractable at 41 trials. 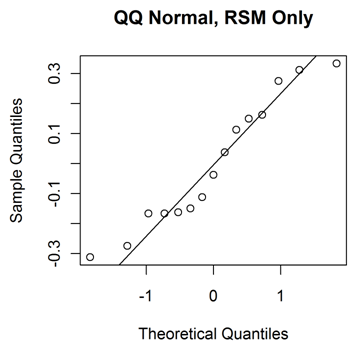 Of course all this assumes Q has tolerable variance.